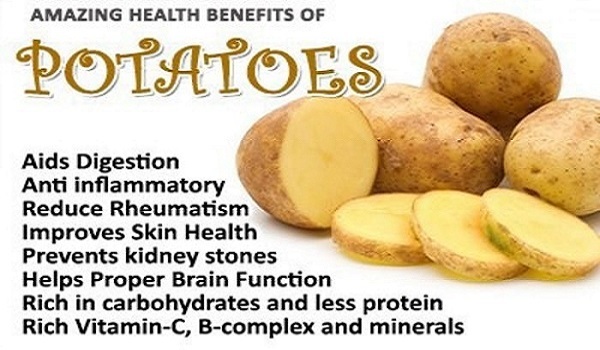 Many health benefits of potato, amazing! Potatoes are one of the most common and important food sources on the planet, and they contain a wealth of health benefits that make them all the more essential as a staple dietary item for much of the world’s population. Many children around the world often refuse to eat their vegetables, yet they share something else in common. They almost all like potatoes. This is the strange and magical quality of potatoes; you will rarely find anyone who dislikes them or refuses to eat them. They are in almost every major continental diet in some form, and they can be prepared in dozens of ways, including baked, fried, sliced, mashed, and many more. Potatoes originated in the Andean mountain region of South America. Researchers estimate that potatoes have been cultivated by the Indians living in these areas for between 4,000 and 7,000 years. Today, this vegetable is one of the most popular throughout the world and the main producers of potatoes include the Russian Federation, Poland, India, China and the United States. Potatoes should not be stored around onions because both vegetables emit natural gases that cause the other to decay. Potatoes should not be stored in the refrigerator, as their starch content will turn to sugar giving them an undesirable taste. Minerals: If potatoes are consumed regularly, we can ensure a good supply of water and ions in your body. Potatoes are rich in potassium, magnesium, phosphorus zinc and are good for the skin. 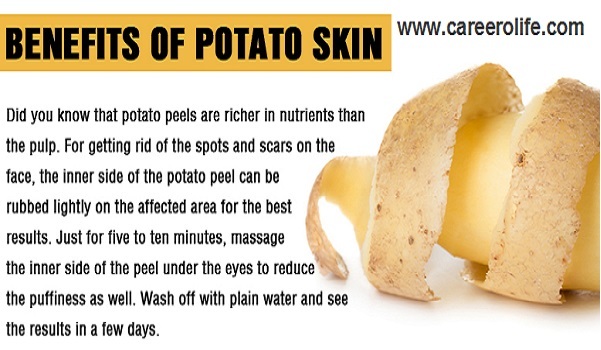 So, eating the potato with its skin is always beneficial. They also contain calcium and iron. Vitamins: Potatoes contain large amounts of Vitamin C present in them. In addition to this, they also contains Vitamin A, B and P. High concentration of vitamin B6 in potato earns high marks as a health-promoting food. Vitamin B6 plays numerous roles in our nervous system and is a key player in athletic performance and endurance. Water: In Potato water accounts for about 70-80 percent of their weight. We have a general misconception that by eating potatoes one will become fat. If our potato dish contains large quantities of greasy butter, sour cream, melted cheese or bacon bits then it can be a potential contributor to a heart attack. If we can’t keep away from those high-fat and high-cholesterol greasy French fries, or potato chips then one is bound to become overweight. 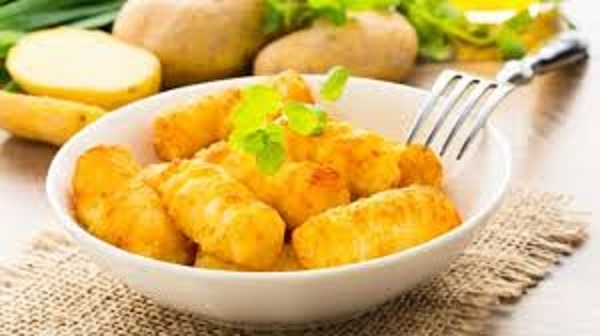 Starch: Potatoes contain about 17% starch and they are one of the best natural sources of starch. However, one should avoid eating sprouted potatoes as sprouting leads to the conversion of starch into sugar. Peeling the potatoes before cooking should be avoided. The protein and mineral content beneath the skin is very high so if we eat the skin along with the inside part, we get all these nutrients, or else we will primarily end up eating is just carbohydrates. When we boil potatoes, first we should heat the water to its boiling point and then add them. This will reduce the cooking time and help us maintain the Vitamin C content. Frying of potatoes should be minimized, as 75% of Vitamin C is lost during frying. We can use other cooking methods such as baking and steaming to reduce loss. Improves digestion- Since potatoes predominantly contain carbohydrates they are easy to digest and facilitate digestion. The fiber content in potato helps in prevention of constipation. The vegetable improves bowel movement and keeps the digestive tract healthy. Fiber is also connected with scraping cholesterol out of the arteries and blood vessels, thereby increasing heart health. Reduces blood pressure- Potatoes can be used to relieve high blood pressure due to tension. They should be avoided if the high blood pressure is a result of diabetes. The fiber present in it is helpful in lowering cholesterol and improves functioning of insulin in the body, which aids in the lowering of blood pressure. Baked potatoes are rich in potassium and magnesium, which are important for healthy heart. Reduces inflammation- Potatoes are very effective in reducing inflammation both internal and external. It is soft, easily digestible & contains a lot of Vitamin B6, potassium and vitamin C which can relieve inflammation of the digestive system and the intestine. Vitamin-C is also a very good antioxidant that repairs tissue wear and tear. Hence, people who suffer from arthritis and gout can use potatoes for their anti-inflammatory impact, but should eat baked potatoes instead of deep fried ones. Protects Skin- Potatoes rich in Vitamin-C and B-complex also contains minerals like potassium, magnesium, phosphorus and zinc are good for the skin. Vitamin C as an essential nutrient that works in our bodies as an antioxidant to help prevent damage caused by the sun, pollution, and smoke. Crushed raw potatoes pulp, mixed with honey, can work well in skin and face packs. This even helps to cure pimples and spots on the skin. Potato pulp, applied externally on burns, provides quick relief and faster healing. Smashed potatoes, and even potato washed water is very good for softening and cleaning skin, especially around the elbows, and the back of the hands. Relieves Rheumatism- One of the home remedies for rheumatism is Potato. Vitamins like the calcium and magnesium help to provide relief from rheumatism. Water obtained from boiling potatoes can relieve the pain and inflammation of rheumatism. However, due to high starch and carbohydrate content, it tends to increase body weight which may have adverse effects on rheumatic people. So external application is better than consuming the potato itself. Weight gain- Since Potatoes are rich in carbohydrates and contain very little protein so it is an ideal diet for those excessively lean or thin people who desperately want to put on weight. Vitamin-C and B-complex, present in potatoes also help in proper absorption of carbohydrates. That is why potatoes make up a large part of the diet of sumo wrestlers, as well as many other athletes who need large energy reserves to burn off in order to compete. Brain Function– Brain to function efficiently depends largely on the glucose level, oxygen supply, vitamin-B complex and certain hormones, amino acids and fatty acids like omega-3. Potatoes cater to most of these needs. They are rich in carbohydrates, and thereby maintain good levels of glucose in the blood. This prevents the brain from letting fatigue creep in and it keeps your cognitive activity and performance high. Now, the brain needs oxygen, which is carried to the brain by the hemoglobin in the blood; its main constituent is iron which is present in potatoes. Thus they help deliver oxygen to the brain as well. There are a wide variety of vitamins and minerals in potatoes that positively affect the function of the brain, including phosphorus, zinc, and the B complex vitamins. Prevents cancer- Fiber intake from fruits and vegetables like potatoes are associated with a lowered risk of colorectal cancer. Research has shown that potatoes contain a compound called quercetin, which has been proven to have anti-cancer and anti-tumor properties. High levels of vitamin A and C both have antioxidant qualities that can protect our body from the devastating effects of cancer. Building Bones-Iron, phosphorous, calcium, magnesium, and zinc in potatoes all contribute to the building and maintenance of bone structure and strength. Iron and zinc play crucial roles in the production and maturation of collagen. Though phosphorus and calcium are both important in bone structure, the careful balance of the two minerals is necessary for proper bone mineralization consumption of too much phosphorus with too little calcium can result in bone loss. Prevents Scurvy- High level vitamin-C present in potatoes can help prevent this disease, caused by a deficiency of vitamin-C. It is characterized by cracked lip corners, spongy and bleeding gums, and frequent viral infections. In certain nations of the world scurvy still exist, this can be check by the abundant presence of potatoes to solve this problem. Some care also needs to be taken while eating potatoes. Green potatoes are often poisonous, and so are potato leaves and fruits, as they contain alkaloids like solanine, chaconine and arsenic. An overdose of those chemicals could easily prove fatal. People who are obese, trying to lose weight or diabetic should avoid eating potatoes. If eaten, potatoes are healthier when baked, rather than raw or fried. Hello! Someone in my Facebook group shared this site with us so I came to check it out. I’m definitely loving the information. I’m bookmarking and will be tweeting this to my followers! Outstanding blog and wonderful design and style.